Enter: Netflix. While Blockbuster stocked new releases and a few popular classics, Netflix had a seemingly endless selection of movies and tv shows to choose from. Frustrations over Blockbuster’s late charges were rampant, but you could hold onto a Netflix rental for as long as you wanted. And Netflix rentals came right to your mailbox—no need to drive or find parking. Once Netflix and cable companies started streaming, and audiences got a taste for that kind of convenience, Blockbuster’s coffin was nailed shut. As of May 2018, there were only six, independently run Blockbuster stores, most of them in Alaska. And Blockbuster’s story has become a cautionary tale. Reasons for its demise can be pointed in a few different directions—Netflix, leadership, consumers’ laziness—but the prevailing theory is that Blockbuster couldn’t (or refused to) evolve in a shifting landscape. Today, another industry is experiencing a shift: healthcare. With patients paying more out of pocket for medical care, they are demanding a friendlier, convenient, and efficient experience. That experience extends from the ability to make an appointment right away to the warmth of the clinical staff through the ease of paying their bill once the care has been received. Providers who neglect to address these new expectations run the risk of following in Blockbuster’s footsteps. Revenue cycle leaders may not have a lot of influence on admissions or clinical experiences, but the financial experience is just as important to patients’ overall satisfaction, and we can have a huge impact in that arena. One example is the availability of flexible payment options. Most patients have every intention of paying for their medical treatment, but they don’t have the ability to cover a large expense all at once. Give them the option of making incremental payments and they will be more likely to pay the entire bill as well as feel more satisfied with their care. In this shifting market, patients are also much more interested in price. They have new expectations regarding estimates and price transparency. More than 90% of patients want to know what their care will cost them in advance. Pre-care estimates are no longer a “nice to have”—they are quickly becoming table stakes. Perhaps most importantly, patients want to be listened to and treated like people, not like accounts. Patients are people, and people want to feel that their care—including the financial aspect of it—has been custom-tailored to them and their needs. 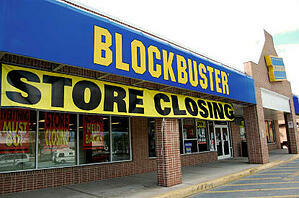 It’s easy to look back on Blockbuster’s collapse and see exactly how and why it failed. . In ten or twenty years, will the missteps of healthcare providers that failed to meet patients’ needs be so clear? It’s hard to say. But if you’d rather be the next Netflix instead of another Blockbuster, the time to act is now.